The orange creamsicle cocktail is truly an amazing drink. We have had creamsicles for decades and the frosty orange crust has always kept that delicious creamy interior all in place on a hot day. I remember eating creamsicles on the beach when I was five, and they really were my mom’s favourite kind of summer treat. As a cocktail, adults can savour the same flavours as they did as a kid, just now with a bit of a buzz afterwards. The creamsicle isn’t much different than your standard Screwdriver. Here we take a vodka (orange flavoured vodka just for that added citrus burst) and add it to some orange juice. For added sweetness, add in a little triple sec (a sweet, orange flavoured liqueur) and a little fresh cream. whole milk can be used as well if you happen to be low on cream. 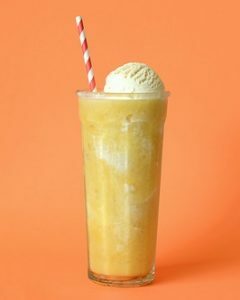 Finish the drink off with a dollop of premium vanilla ice cream and enjoy your concoction as if it were a root beer float! Add a spoon, and of course a straw.